This entry was posted in No Pressure, TV on August 31, 2018 by Kat Kinsman. Writer Kat Kinsman takes on a common condition in Hi, Anxiety: Life with a Bad Case of Nerves. Not only does she share poignant stories of her own experiences with the illness, she shows how millions are impacted. In doing so, she sets a powerful example of how we should all be working to end the stigma. You may know Kat Kinsman from her work as an editor at Extra Crispy, or her work with Chefs With Issues. In Hi, Anxiety, Kinsman explores anxiety and depression through her own experiences with both, writing with candor about each has affected her everyday life. Anyone who’s suffered from anxiety knows that it’s a particularly paradoxical disease, because as much as serious anxiety is no laughing matter, it’s also so sublimely absurd that it’s hard not to laugh at yourself. 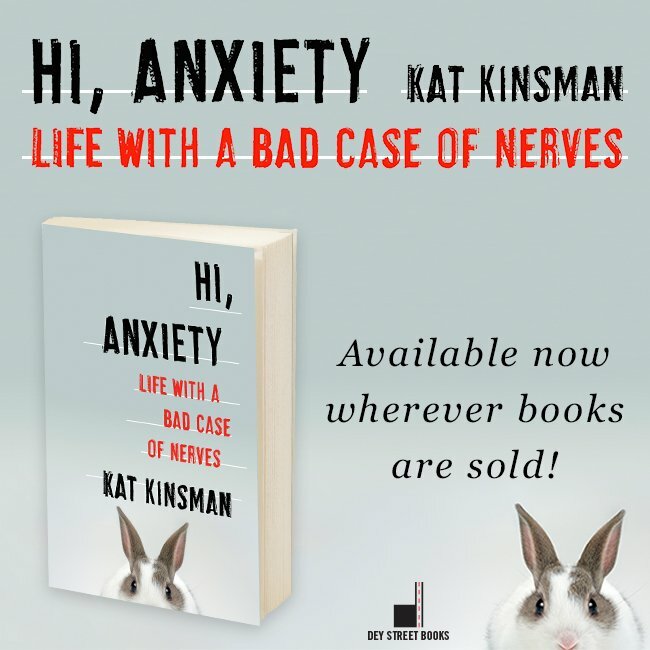 Kinsman bravely and brilliantly captures the difficulties of dealing with anxiety, using her sharp wit and lucid prose to take readers on a journey into the depths of an anxiety-riddled mind. This entry was posted in Uncategorized on November 13, 2016 by Kat Kinsman. This entry was posted in Publicity on August 13, 2016 by Kat Kinsman. I’m a 43-year-old teenager, sulking, silent in the passenger’s seat of my father’s Subaru, and he’s doing his level best to fill up the air—mostly by pointing out the local landmarks of Mauldin, South Carolina. There’s the corporate headquarters for Bi-Lo groceries in case I was wondering where all the trucks were coming from (I hadn’t noticed. ), the Duke’s Mayonnaise plant, an intersection that’s tricky after dark, in case I was ever out this way again at night. He’s trying to help and I love him for it, but I’m several clicks south of helpable at the moment and just trying to soldier through. That’s what decent people do. I suppose. I haven’t felt especially decent or much like a person since I landed yesterday. So I approximate what I hope is a neutral, perhaps even mildly pleasant expression and solder it onto my skull as we park the car and amble toward the low brick building with an armload of boxes. He’s limping noticeably and sports a massive, dusk-dark bruise on his forearm, exploding out from a pale, pinprick center. He’s tired, too, from the medication (“Better that than dead,” he says. “Yup,” I say.) but he’s still unmistakably my Pup. There, just inside, is my mother—or at least what’s left of her. I never know quite what to expect from visit to visit. Parkinson’s Disease (which killed her brother a few years ago) and Lewy Body Dementia are an especially cruel roulette that way. In the two months since I’ve last seen her, they’ve knocked walking and swallowing solids out of play, replacing them with a full time wheelchair and a joyless slurry of pureed foods. But in a fit of whimsy, today they’ve given her back my name. It’s been years since I’ve heard it pass her lips. It comes out in a croak and knocks me off balance. This entry was posted in Mental Health, Writing on December 21, 2015 by Kat Kinsman. This entry was posted in Drinking on December 9, 2015 by Kat Kinsman. I’m ridiculously excited that Eater selected my posthumous profile of restaurant critic Seymour Britchky as one of their 21 Best Longform Food Stories of 2015. This entry was posted in Britchky, Writing on December 9, 2015 by Kat Kinsman.